We review the history and trends of multimedia technologies, especially focusing on audio & video products. Our lifestyles have been changing according to the developments of these technologies. We forecast the direction of multimedia technologies and our lifestyles in future. We can guess that the future direction of audio & video is going to higher and higher fidelity. Display devices will be larger and flexible. In addition, wearable devices will be popular as consumer products. It will be achieved by printing manufacture technologies. These devices and high fidelity content will realize immersive super reality. While we will enjoy the traditional audio & video content with the immersive super reality, we will use more social media by which realtime & global human-human interaction will be realized. We will be able to utilize other people’s knowledge and decisions in realtime using the interactive & immersive super reality. In addition to the social networks with humans, sensor & actuator networks will also be globally established. This will extend our perception and decision abilities. We will find new problems with the distributed sensor & actuator networks, which we did not find with our ordinary perceptions. Using interactive & immersive super reality, we will collaboratively solve personal daily problems as well as global problems. Thus, in future we will realize collaborative community with interactive & immersive super reality. In the community we will enjoy entertainment content and will solve many problems collaboratively. This community itself will be the content in the future. 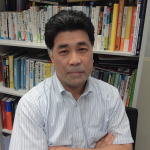 Masahiro Fujita is currently Vice President of System and Software Technology Platform at Sony Corporation, Tokyo, Japan. He received a B.A. in Electronics and Communications from Waseda University, Tokyo, in 1981, and an M.S.in Electrical Engineering from University of California Irvine, in 1989. He joined Sony Corporation in 1981, and worked for development of a spread spectrum communication system, which was used in a receiver of global positioning system for a car navigation, and for VLBI (Very Long Baseline Interferometetry) for a earth quake forecast system. From 1988, he became a graduate student of University of California, Irvine, and studied artificial neural networks for visual perception. After he returned to Sony, he started the Robot Entertainment project from 1993, and developed the entertainment robot AIBO, which started to sell in 1999. After the AIBO project, he has been in charge of development for cognitive part of a small humanoid robot QRIO. In 1998 he proposed to establish RoboCup four-legged robot league using AIBO as platform, which was one of 4 official physical robot leagues in RoboCup until 2007. In 2008 he became a president of System Technologies Laboratories, Sony Corporation, where he led incorporating intelligent functions for Sony products and services, such as personalized recommendation, augmented reality (SmartAR), and so on.